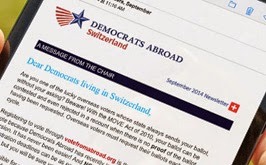 Democrats Abroad Switzerland: Democrats Abroad needs you! Will you volunteer on 29 September? Democrats Abroad needs you! Will you volunteer on 29 September? Can you volunteer for 2 hours? 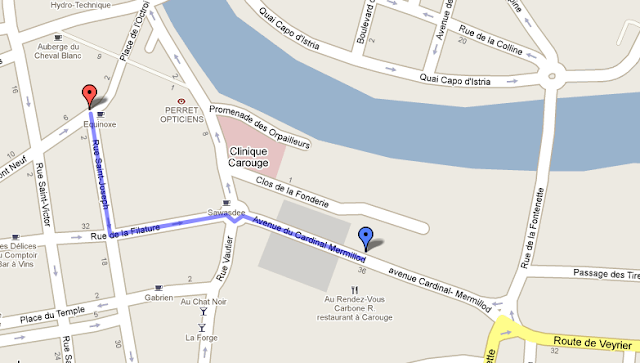 Below map shows walking directions from tram stop Armes (red) to Centre Commercial de Carouge (blue). If you will arrive after 7pm, the Commercial Centre doors may be locked. Use the entrance that is at #36, between the hairdresser and the travel agency. Type in B0604 on the small keypad to the right of the door and it will ring the studio so we can buzz you in! Call 022 301 8188 if you have trouble. Parking is available in the Centre Commercial de Carouge. Take the elevators from the underground garage to the 6th floor. Students: we will provide Skype-out credit! Anyone who really wants to help but has neither of the above, we have 1 fixed line phone you can use. Want to volunteer but not comfortable making calls? We need some database help behind the scenes. Email secretary@democrats.ch to find out more. This is our last phone banking drive. Absentee ballot requests from Americans abroad must be sent in by October 4th for most states. Help us make sure all our members know they need to register for a ballot via www.VoteFromAbroad.org! And we have to ask: Have YOU sent in your request for an absentee ballot to vote in November? If you have not yet received your ballot in the mail - this means you are probably not registered for this year's election. Go to www.VoteFromAbroad.org today!